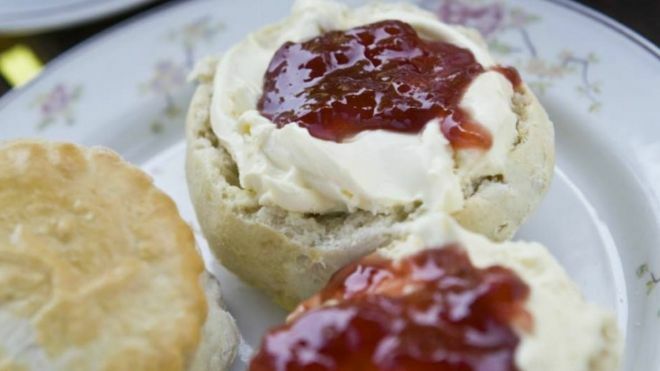 If you’re not already up to speed with the news story of the week, the National Trust managed to completely outrage the entire county of Cornwall over the weekend with an advert for its Mother’s Day cream teas at the Lanhydrock Estate. The evidence is there for all to see in the photo below, there are no mitigating circumstances and the Trust’s marketing people should clearly all resign in an attempt to promote reconciliation across the Cornwall-Devon border. The crime? THEY PUT THE CLOTTED CREAM ON FIRST. I’ve come over all cold, I could barely type the words. For Pete’s sake, people, that’s what they do in Devon. It’s wrong, just wrong. We’ve had the building team here again today, and the indignation levels on our ground floor would probably have gone off the scale on a Geiger counter. Geoffrey guided me through the key points of cream-tea-eating (especially with me being a northerner and ergo a complete novice in this area), stressing his key point that if you put the cream on first, you can’t add more, or not without everyone else around the table noticing you are being a bit of a piggy anyway. Obviously in Devon they have to make a cream-versus-jam-ratio judgement before they commit to adding the jam. Crikey, I’m never moving across the border, I’d never stop dithering. Ian-the-plumber-bathroom/kitchen-fitter, unusually, didn’t have a great deal to say on the subject – not sure if that was because he was still in cream-before-jam shock or possibly had more to do with the fact that he spent most of the day lying on the floor with his head inside a radiator and half a dozen screws wedged between his teeth. I busied myself in the kitchen – it seemed safer to be on a different floor. Ian’s wife Jenny, who I believe is not usually a big cake eater (why am I not one of those people, then I’d be thin? ), has asked for the recipe for a blackberry & apple tea-cake that I made for her as a thank you, when she was kind enough to clean my new kitchen for me before we got back from Turkey last year. I thought I would make her another one and put it on the blog, so that she had both the recipe and the cake to work from. Of course I had to make two, as I couldn’t give Ian and Jenny a cake without sending one home with Geoffrey for his wife Agnes. (Ergo if it looks as though there is more mixture in my bowl than yours, it is because I was making double the quantity in the same bowl). For the avoidance of doubt, there is no cream involved at any stage of this recipe, though now I’ve said that, it strikes me that a dollop of clotted cream wouldn’t be a crime here. As long as you add it last, of course. Pre-heat the oven to 150ºC. Peel the apples, cut each one into four wedges and remove the cores. Cut across the wedges into thin slices. Add the softened margarine/butter and sugar to a mixing bowl and whisk until combined. (If your margarine is not soft, zap it in the microwave for 10 seconds or so). Break the eggs into the bowl and whisk until smooth – your mixture may curdle a little, this is not important and will smooth out when you add the flour. Whisk in the ground almonds and the almond extract, then stir in the flour – the mixture will be quite thick by this stage, so you may find it easier to switch to a rubber spatula or wooden spoon. Add about three quarters of the apple slices and 100g of the blackberries and stir into the mixture. Tip the mixture into your prepared tin, smooth the top with a spoon, then scatter over the remaining apple slices and blackberries. Sprinkle the top with a little Demerara sugar and a few chopped or flaked almonds (you can buy them ready chopped in the supermarket). Bake for around 55 minutes – when the cake is ready it should be a deep golden brown, and firm to the touch, and you will probably see that it is starting to shrink away from the side of the tin. If your oven has hot spots, you may need to turn the cake around part way through – check after about 40 minutes, so that your cake doesn’t sink when you open the oven door. This is lovely served just slightly warm, in which case clotted cream can only be a good thing, but is just as nice served cold. It will keep for several days in an airtight tin. Posted on March 13, 2018 March 14, 2018 by JaynePosted in Cakes & Baking, Desserts & puddings, Picnic food, VegetarianTagged almond, apple, blackberry, blackberry and almond cake, blackberry and apple cake, cake, clotted cream, dessert, easy, tea.